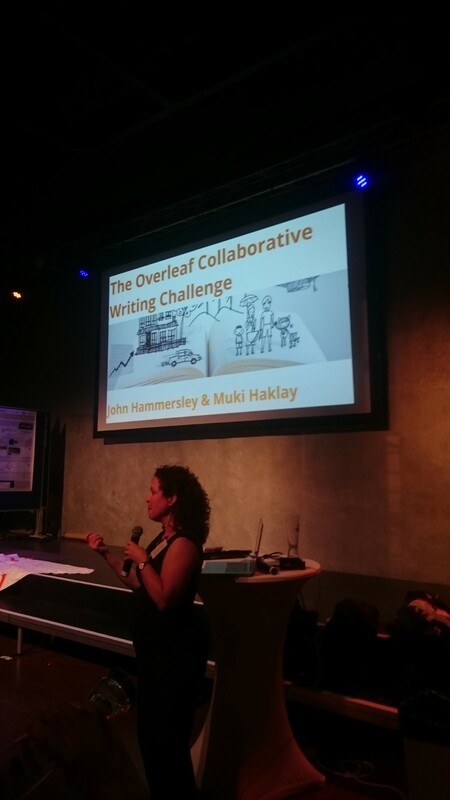 Overleaf, ThinkCamp Challenge, collaborative writing – lots of jargon for a title – so let’s start by explaining them and I then cover what happened (that’s an Abstract). Overleaf is a scientific technology company that offer a collaborative environment for writing scientific papers. Overlaf is based on LaTeX – a typesetting software that is popular in many disciplines – Computer Science, Physics, Mathematics, Statistics, Engineering, Economics, Linguistics and other fields. Importantly, Overleaf simplifies the scientific writing process by providing templates that scientific journals use, support for collaboration, adding comments, and other tools that make it easy to write academic papers. LaTeX is complex to use, and Overleaf is aimed at facilitating the process of learning and using it in academic writing. Overleaf was a sponsor of the European Citizen Science Association conference ThinkCamp, so together with them we developed a challenge . So let’s explain what is ThinkCamp before turning to the challenge. 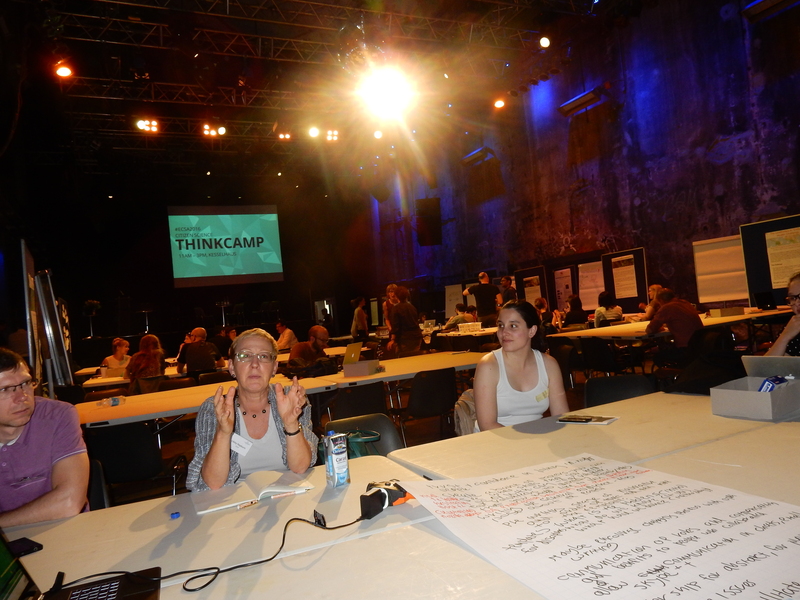 A ThinkCamp, is a type of open events that are associated with the ‘unconference’ approach, which in our context mean taking a part of an academic conference and opening it up to anyone who want to step forward and explore a topic that came up during the conference, or that they have been working on it for a while. 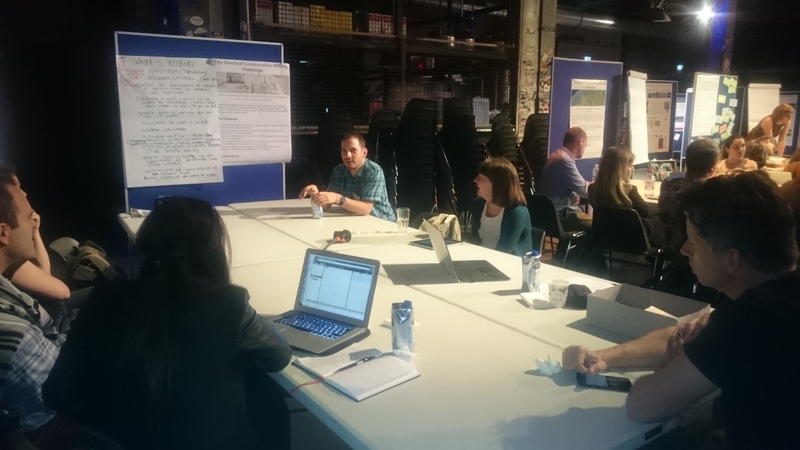 Particularly for ThinkCamp, the activity is structured around discussion/exploration groups that are provided space to write, draw and share ideas. The themes are called ‘Challenges’. Some of the themes are offered in advance by people who are coming to the conference, and there is usually space for people to suggest their ideas on the day. The day starts with a one minute description of each challenge. Even with the planned challenges, those who proposed them can’t say much about them, and they are looking for the collective intelligence of those who are interested in the topic to explore it. In effect, ThinkCamp is multiple brainstorm ing and idea generation events happening in the same space. People can move between groups, drop in and out, and contribute as little or as much as they want. A Challenge can be physical or require programming, but can also be purely based on discussion. 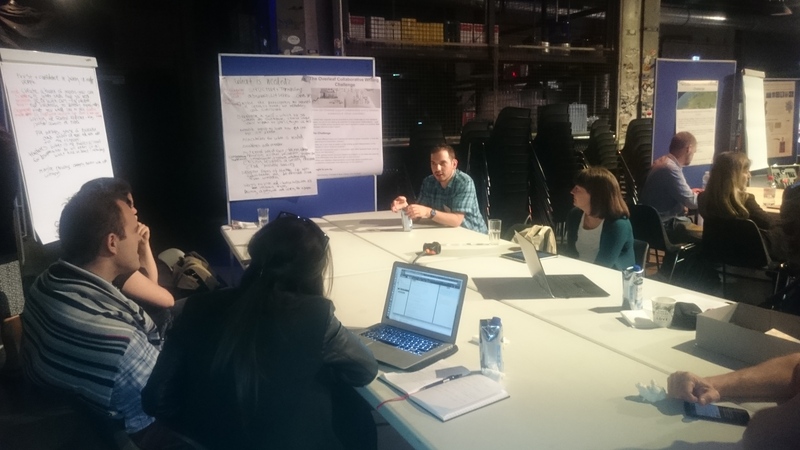 For the ECSA 2016 ThinkCamp, the conference organisers invited the local Berlin grassroots science & maker communities to collaborate together with conference attendees on a number of Citizen Science Challenges. and citizen scientists?‘. The focus here is on scientific papers that are coming out of a citizen science project. It is now becoming more common to include citizen scientists as co-authors in the title of the paper. However, can they have more direct involvement in the process of writing so they are more involved in the scientific process? This was the ‘research question’ (more accurately, idea) for the session. We had a table, and two session, each of about hour and a half. In each session, about 6 or 8 people joined me, with one person staying for both session (Artemis Skarlatidou), and other people joining for parts or the whole discussion (among them Alison Parker, Avinoam Baruch, Berk Anbaroglu, Christian Nold, Denise Gameiro, Jon Van Oast, Julia Aletebuchner, Libby Helpburn, Lotta Tomasson, Sultan Kocaman, and surely several other people). 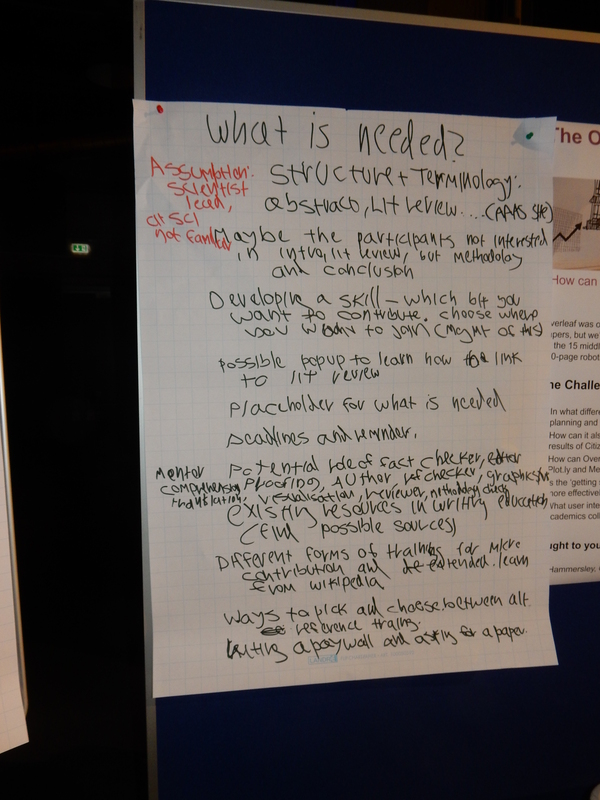 We had a table with a poster, which included information about the challenge. 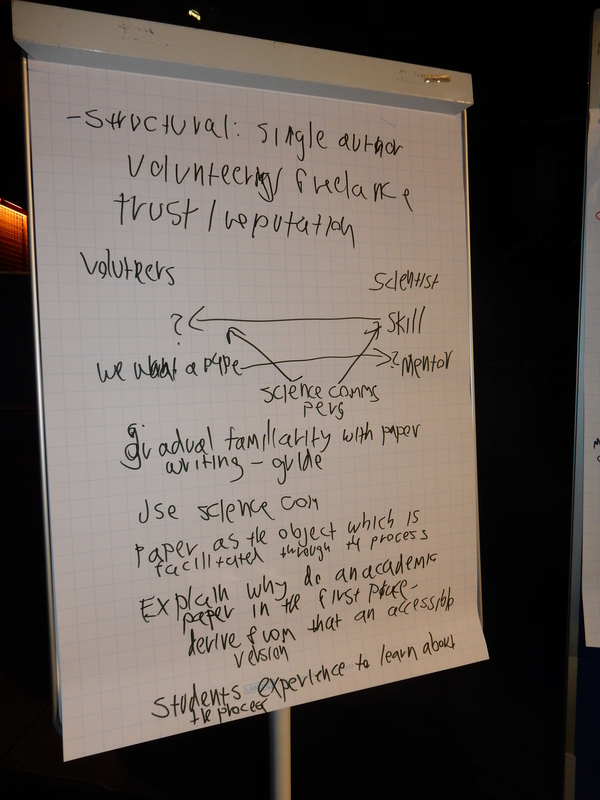 Although we have looked briefly at the Overleaf system during the beginning of the discussion, it expanded very quickly to the core issues of collaboration between scientists and citizen scientists on writing paper together. I have attempted to facilitate the discussion while allowing people to raise their point and discuss them at length. As usual, some discussion points led to other discussion points. 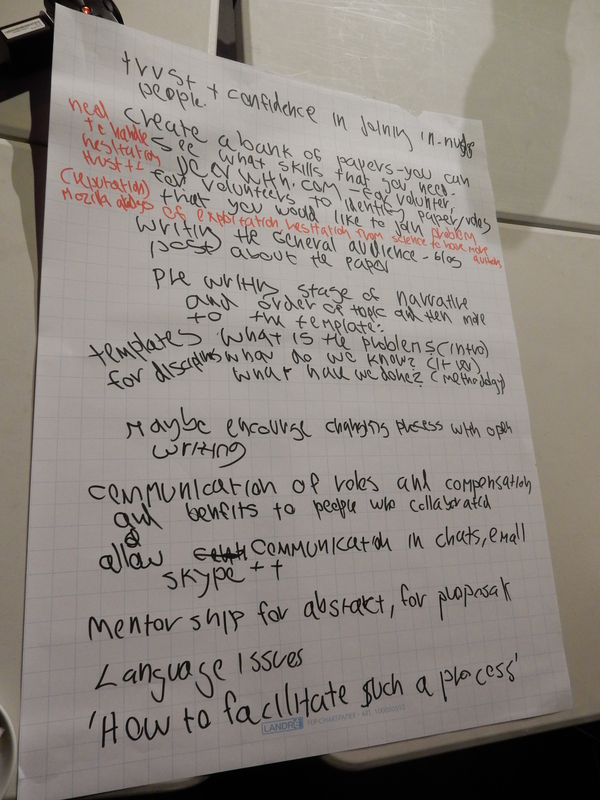 During the three hours, we filled about 4 flip-chart pages, which are provided below (Figure 1). So what did we discussed? We refined our problem, and decided that our assumption is a situation where a scientist initiate the paper and lead the process of writing, but in collaboration with citizen scientists. Of course, papers that are led by citizen scientists are very important, but as with many prototyping activities, we wanted to start with a scenario that make the problem less hard – at least one of the members of the team will know what is expected in terms of the publication process. There are many citizen scientists that already publish (e.g. astronomy, biological recording – see diary of a citizen scientist which in the last pages describe the scientific outcome of her work), but we’re talking about the general case, and I still recall how daunting the first paper feel, and I also know how special it feel to have the first paper published (it’s one of the precious things of working with PhD students), so let’s assume that we’re talking about first paper, with someone helping. The topmost issue is to explain to citizen scientists why a peer review paper is a worthwhile effort – some websites and systems (e.g. Public Lab research notes) are offering alternatives to academic publication – however, having a peer review can increase the value of the work in terms of policy impact, authority and other aspects. What are the exact reasons for people to join in? this is something that we need to understand more. We started with the components of paper: introduction, literature review, methodology, results… and the need to understand why they are there and how to understand them. There is the AAAS website that helps in learning how to read an academic paper. Some tips are also available in other places – and that there are so much material online to teach people how to read scholarly articles, tell you that it’s not a trivial task! For this, we can also research and identify material on library websites that teach undergraduate students how to read and write scientific papers, and choose the best resources for citizen scientists. We need to indicate that some effort is required, but also chunk the learning material. Having pop-ups and context specific help to a section of the paper, and, as Overleaf already do, have the sections with place-holder in place. Once people learned what is the aim of the project and the components of an academic paper, we need a way for people to show which part they would like to contribute to – maybe they want to comment on the methodology and not on other parts (so we might have a matrix linking people with parts of the paper). Further discussion lead to the main insight of the discussion: We can split the roles that are needed in academic paper writing, and allow people to decide what they want to do. The roles include: authoring text, fact checking, reference checking, chart and graph design, map design, translation, checking for comprehension, proofreading, reviewing, checking the statics for mistakes and possibly more. We can think of a system to match between skills and task – like PeerWith but there are problems: first, we should do it inside the project, and be careful not to get into exploitation and undermining freelance editors, proofreader, graphic designers etc. There is, of course, huge advantage for engaging people from within the project – they will do the work from a much more informed position. 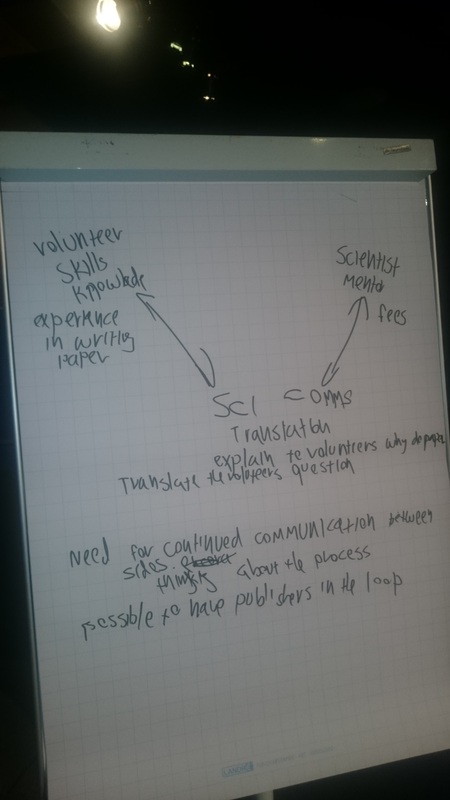 Consider projects with many thousands of volunteers (OpenStreetMap, Zooniverse, BOINC) – it is possible to link the multiple skills of participants to the many scientists who are involved in different projects and might want to work collaboratively on papers. Under these conditions – we will have major issues of trust by all sides, and confidence by the citizen scientists that they can contribute. We need interfaces nudges and support to overcome these. We need to clearly communicate what are the aspects of the role, compensation & benefits (e.g. authorship, payment?). Back to the process of writing the different sections of the paper, we can give elements of training to contributors, according to how much they want to commit and how much time they’ve got. Probably it make sense to do micro-training with expanding levels of information. We need to consider how we open up papers and material that sit behind a pay-wall to allow citizen scientists to be involved in a meaningful way. We can also consider a gradual process, where there is a pre-writing stage in which we agree the narrative, order, and images that will be used – we can use accessible language to sort out the list – e.g. ‘what is the problem?’ (for the introduction); ‘what do we know?’ (literature review); or ‘what have we done?’ (for the methodology). We can think of the paper as the final object, and have a structure to support its development through sub-objects. The second major insight of the session was the introduction of a role for science communication experts, as facilitators between citizen scientists and scientists. The process will need a lot of communication, and we need to link to tools for managing chats (instant messaging), calls and maybe video. The volunteers need to be mentors and get feedback, so improvement of skills. We explored what each side bring to the equation: citizen scientists – skills, knowledge and they gain experience in writing a paper and having a scientific publication with their name on. Science communicators – translation between scientists and citizen scientists, ability to explain why paper is valuable, what are the parts of the paper and why things happen the way they are. They gain by being employed with an active role in the process. Scientists benefits by having lots of help on their paper, and they need to act as mentors and cover the publication fees (assuming open access). We realised that this is complex process that will need plenty of effort to make it happen, but that it is possible to facilitate with Web tools. There are plenty of open issues, and it might be an idea to develop a small research/public engagement project on the basis of these ideas. If you have ideas, comments and suggestions – please help us!